Cassini's orbits around Saturn come along at a faster clip now, with eight-day-long Rev68, the spacecraft's 69th orbit of the ringed planet. Despite the short orbit, Cassini's observations this time around include a wide variety of targets, including Saturn's atmosphere and rings, Tethys, Dione, and Janus. Cassini begins Rev68 on May 14 at its farthest distance from Saturn, called apoapsis. At this point, Cassini is 1.34 million km (835,000 mi) from Saturn. The high inclination of this orbit allows for detailed study of Saturn's ring system and northern hemisphere from high above the ring plane. On May 14, Cassini will acquire a six-frame, eight-color mosaic of the unlit side of the rings using the wide-angle camera. The next day, the Visual and Infrared Mapping Spectrometer (VIMS) and ISS teams will observe the F ring for 18 hours, watching for changes in the various clumps and channels in the ring. On May 15, Cassini performs several observations of Saturn's small satellites, including Atlas, Pandora, Janus, Pallene, and Telesto. These observations are designed to study the orbits of these objects and how they might evolve over short periods due to perturbations from the other satellites in the system. On May 17, Cassini reaches periapse, its closest point to Saturn on Rev68. At that point, Cassini will be 193,000 km (120,000 mi) from Saturn's cloud tops. Near periapse, Cassini will acquire several non-targeted observations of Saturn's icy satellites, including Dione, Janus, and Tethys. On May 17, Cassini will observe Dione as it experiences an eclipse of the Sun by Saturn. Cassini will also observe Janus from a distance of 350,000 km (217,000 mi). 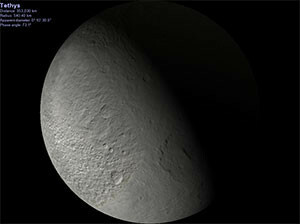 On May 18, Cassini will observe Tethys' south polar region from a distance of 353,000 km (219,000 mi). Prominent near the terminator will be the large impact basin Melanthius; the observation is designed to measure limb topography near the terminator. Following periapse, Cassini turns its focus back onto Saturn and its ring system. On May 18, Cassini will acquire a mosaic of 90 images covering an azimuthal scan of the outer A ring, including the Encke and Keeler Gaps. On May 19 and 21, Cassini will acquire two observations of Saturn's atmosphere. The first is a ten-hour sequence covering the south polar region of Saturn. 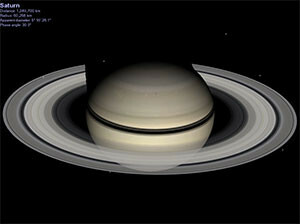 The second will observe features in Saturn's northern hemisphere. Cassini begins the following orbit, Rev69, on May 21. Rev69 includes distant observations of Tethys, Janus, and Enceladus, as well as the last Titan encounter of the primary mission, and the last until July 31.